Although I am a summer girl at heart (and could happily live in 90 degree weather all-year-round) the seasons have certainly changed – fall is definitely here and needs to be embraced. The good part about that is winter boots – one of the perks of cooler/rainier weather (along with scarves, a FAVE accessory of mine!!!). Aside from the Bourge Christian Louboutin to-die-for boots that I NEED to own, one must be prepared with some more practical rain-effective footwear. 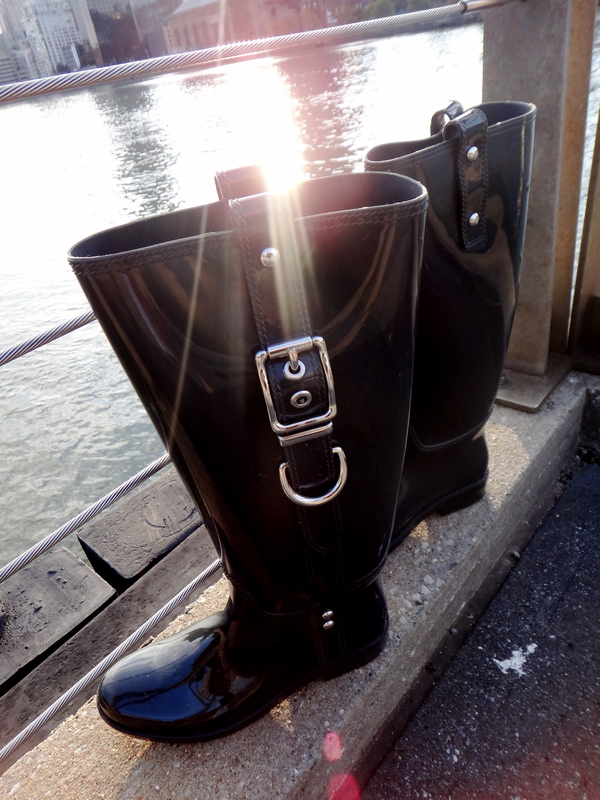 I know Hunter boots are all the rage – and am normally happy to follow a fashion craze. This time however, I went an alternate path. 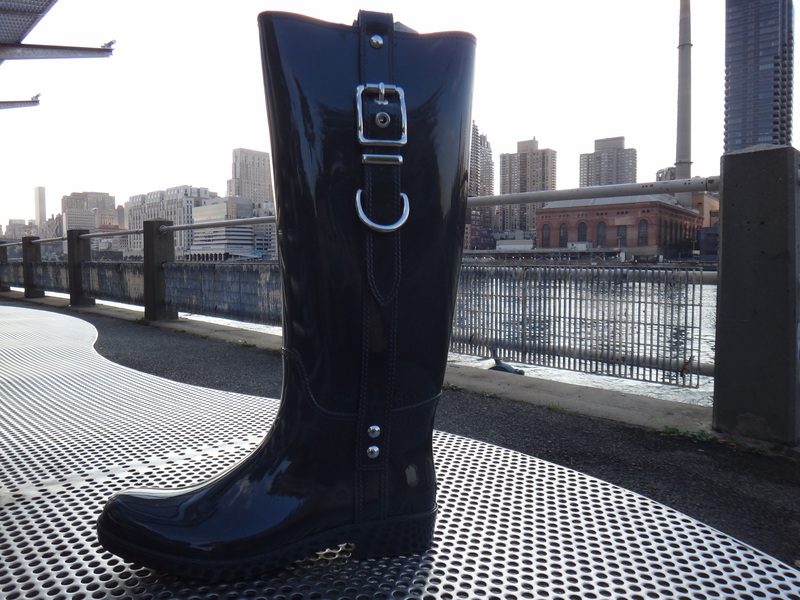 Comfortable and stylish – all while protecting me from the rain and slush that will soon cover NYC streets. Loving the grey and the ever so subtle branding. 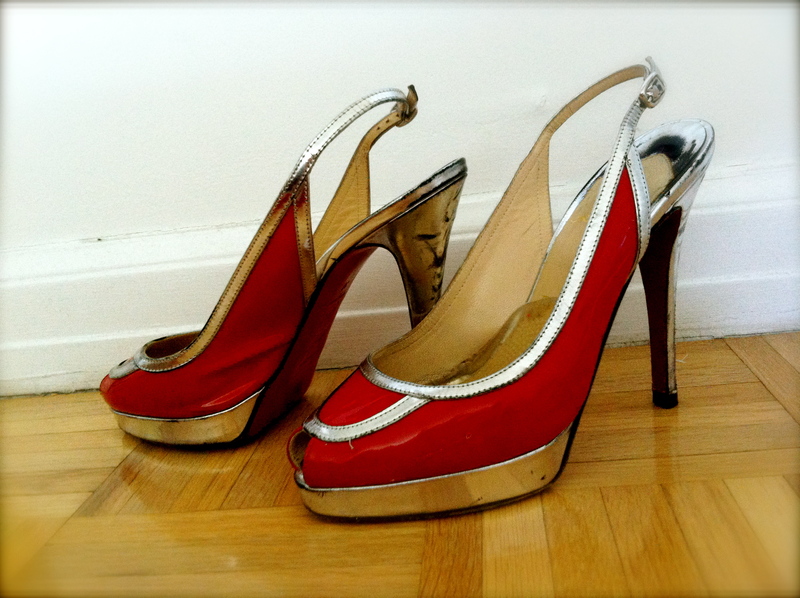 Ohhhh shoes, shoes, shoes… one can never have enough of them, no matter what kind! Will now continue working towards one of my life goals – a larger shoe collection than Imelda Marcos (surely a few thousand isn’t overly ambitious)! You could say I’m into politics – if by “into politics” you mean I am into the chic party (aka. fundraiser) Beyonce and Jay Z threw Obama in NY last week. I could not help feeling patriotic as I visited the nations capital Washington, D.C. Yes, I know I am not even American. Pretty buildings, fantastic architecture and those decorative street lamps that remind me of Paris (although without all that excessive gold the Parisians seem to be so fond of). Then there may be one or two fairly famous monuments and memorials. Outfit choice was tricky. It was a long drive so I wanted comfort – but didn’t want to step out in public wearing the jegging’s again (still haven’t forgiven myself for that one). I landed on my favourite AG jeans and a cute T. What made the T so fitting was the stars – OK so although not the correct color scheme of red, white and blue (forgive the purple) I did feel like the 50 stars featured on my top was a patriotic nod. Hightlight of the very short trip had to have been witnessing Obama’s personal ride arrive. Not every day can you see the President’s helicopter swing by to pick him up – with snipers on the roof of the white house, watching, prepared for action. Thanks to this weekends road-trip through Delaware and Maryland, I now we have 12 states ticked off my list – only 38 to go!! The Standard was anything but! The Standard NYC is certainly anything but. From the outset, when you step out of your yellow taxi onto the charming Meatpacking District cobblestone street, you are hit with the amazing smell coming from the grill. Then luxury engulfs you as enter the hotel foyer. From the dimly light sleek looking foyer – to the elevators video installation by Marco Brambilla, you know you are in for a treat and this is going to be one of those quintessential NYC experiences. This was the setting for Lucky Magazines “Ultimate Style Guide” celebration, suiting venue indeed. With the amazing TRESemmé stylists Tyler & Jeanie on hand to add hair glamour to a room overflowing with it, it was time to talk style. Armani Exchange dress, black tights, a decorative feather headband and black Christian Louboutin Decollete pumps to complete the look. The relationship we have with our hair can only be described as an affair to remember. We remember our good hair days (and those pictures are sure to be plastered all over facebook), shudder at the bad and are in a constant pursuit of the glamorous. Las time I stepped outside the comfort zone of a trim was traumatic – to say the least. The entire office had been walking around like models from their visits to a resident hair guru – I was not so lucky. After waiting weeks for an appointment to this hair genius, it was finally my turn. My creative brief was clear “Shorter, easy to manage as I don’t even have the time to commit to a weekly episode of Gossip Girl – let alone daily styling”. I still need remedies for anxiety just thinking about it — it has only been two years after all. Last night I placed trust in new hairdresser. I ventured to Meatpacking to Bumble & Bumble. Long hair, short hair, layered hair, colored hair, straightened hair, curled hair – all these choices we are faced with when we head into the salon. Early preparation is vital – given I was heading directly to my hair appointment from work the outfit had to be an all day one. I landed on yellow Karl Lagerfeld jeans (the rain and yesterday’s gray weather ain’t keeping these babies hidden in a closet), black top, black Calvin Klein bolero and Ralph Lauren ankle boots. One last thing to balance is the husband request and constant battle of short Vs long hair. Can there be a happy medium?? We will soon find out. Bumble & Bumble was amazing. My stylist was friendly without being over bearing and guided me through my hair cut choices and the balancing act between short and long hair. The salon decor was gorgeous and the surrounding views spanning lower Manhattan breathtaking. Ahhhh….. I’ve found my hairdresser in NY. LOVE this place – will be back for sure! The move to NY materialised due to my obsession with this city (reasons why warrant a post of their own). It did however create another obsession – to visit every state before our return to Australia (yes – even some of the ones that I have been told you could and should skip!!). This leads me to our Philadelphia road-trip adventure. Rocking some lazy weekend wear – I actually stepped out in jeggings (I know – fashion faux-pas, please forgive). They say there are two things that married couples shouldn’t do: Travel or Renovate. They didn’t lie. I gave good directions. I said take the 38. I don’t know if it’s the east or west exit – my iPhone can’t zoom out that quickly with the awesome AT&T coverage i am experiencing…. ask me sooner! Anyway – I will not bore you with the monotonous details, only to say that our two hour road-trip took much longer and our marriage hung in the balance (add to this my car sick daughter). Ever the happy camper – we arrived in Philadelphia and the good mood returned. Let’s get amongst it and see this city! The beautiful buildings, rich history, quaint streets all being enjoyed in gorgeous sunny weather. After a few of the main tourist spots, we stumbled on the shopping!! I was certainly pleased to see that Tiffany’s remains gorgeous no matter which state I visit! Philly – I would definitely come back. P.S I will continue to dispute that I am in fact a good navigator – and people just don’t understand my directions!! As a mommy and a lover of nightlife, I’d like to set up for you the dichotomy that is my Thursday night. Rushing from a school PTA meeting (my daughter started big girls school last week. 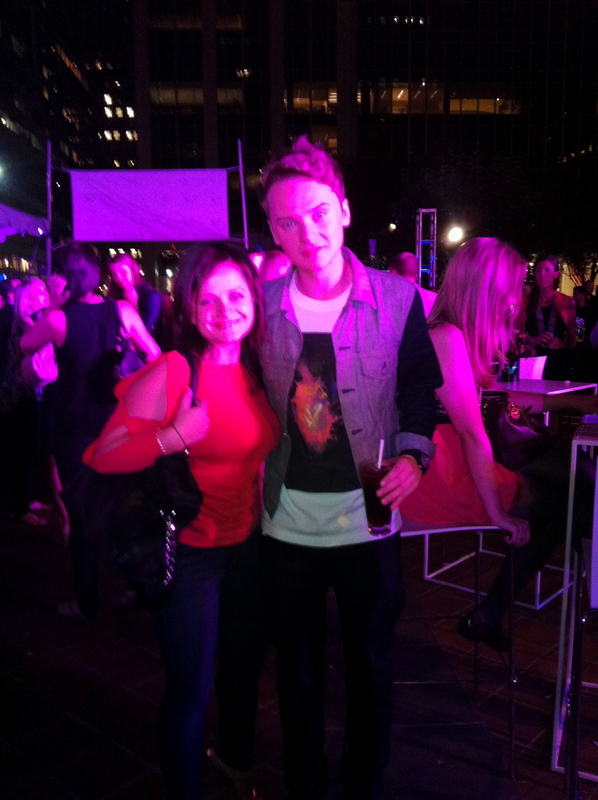 SO CUTE) to a big outdoor party in the city. Running incredibly late so no real time for outfit change. The outfit – my new favourite skinny leg AG Jeans – a cute red top – and finished off with the matching red & silver Christian Louboutin (FoxTrot Slingback) heels. A quick refresh of the make up – and a bold red lip. Off we go…. It was a great party, with the beautiful backdrop of St. Bartholomew’s cathedral. The bar is Inside Park at St Bart’s – on Park Ave next to the Waldorf Astoria – BEAUTIFUL!! The crowd was enjoying the remaining evenings in NY where you can still be outdoors comfortably. Then there was a frenzy of excitement. I was trying to understand what was going on, as this apparent excitement was being caused by a young kid that looked about twelve. Who is he?? (I had no idea) Why are all the girls carrying on? I have since been brought up to speed on the latest in British pop music, and am told he is the new Justin Bieber. Ladies and gents, the twelve year old was Conor Manyard. Just another night in NYC – looking forward to the next one! 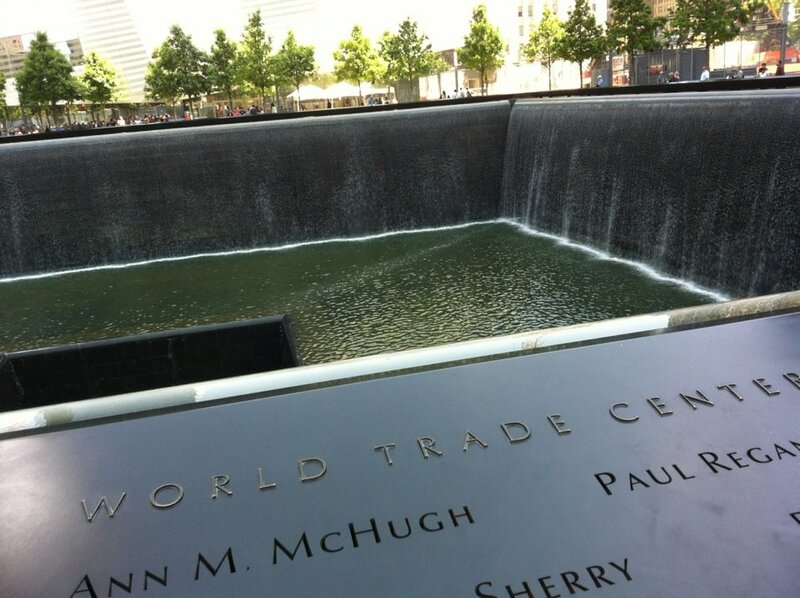 Remembering the chilling events and thinking of everyone that was impacted….